The Maryland state seal identifies government buildings and officials. It is one of the few seals that are dual sided. Only the reverse of the Great Seal is used officially. Fact 1: The Maryland state has a dual sided seal - only the reverse of the Great Seal is used officially. 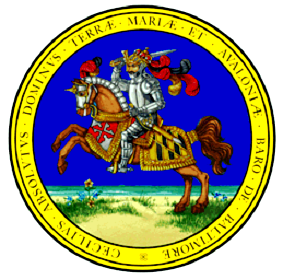 The inscription on the rim of the Maryland State seal shows the phrase, Cecilius Absolutus Dominus Terræ Mariæ et Avaloniæ Baro de Baltimore, which translates to "Cecil, Absolute Lord of Maryland Avalon, Baron of Baltimore"
The caparisons of the horse on which Lord Baltimore is mounted bear his family coat of arms. Before describing the Maryland State seal it should be pointed out that Lord Baltimore took considerable 'liberties' in relation to his insignia, which continues to be displayed on the Seal of Maryland. He blatantly upgraded his heraldic privileges, effectively upgrading his position from Baron to Earl! 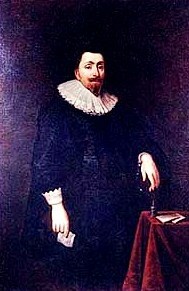 Perhaps he felt justified in doing this by the provision of his charter which gave him virtual sovereignty over his American lands, he was the "Absolute Lord of Maryland". His barred helmet faced front which was the sole prerogative of royalty - he was entitled to display a helmet in profile which signified a peer of the realm. The gold and black arms represent the Calvert family. In heraldry this shape is described as a Lozenge, a diamond-shaped figure that is set diagonally. The red and white colors have a Cross Botonée (or bottony) design of his mother's family, the Crosslands. The description and meaning of the symbols, icons and emblems on the reverse of the seal are detailed below. The Latin words encircling the seal"Scuto bonæ voluntatis tuæ coronasti nos" is from verse 12 of Psalm 5 from the Vulgate and translates to "You have crowned us with the shield of your goodwill." 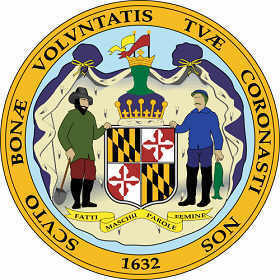 The Maryland State seal is kept and used as required by the Constitution and laws of the state. 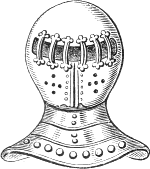 The picture opposite is an updated U.S. Government rendition of the seal (source: (public domain image on Wikipedia) which has included several changes. The original colors of the lord's cloak have been changed from red to blue. The visor has disappeared completely and replaced with a green silhouette. The black (sable) and gold pennants, the colors of the Calvert arms, have been changed to yellow and red Pennants. The red and white colors should depict a Cross Botonee but this is lost in the depiction of the shield.